Erebus & Terror share the stage with Leanne Goose in the NACC Mentee series of concerts. Tickets are $20. More info and tickets here. 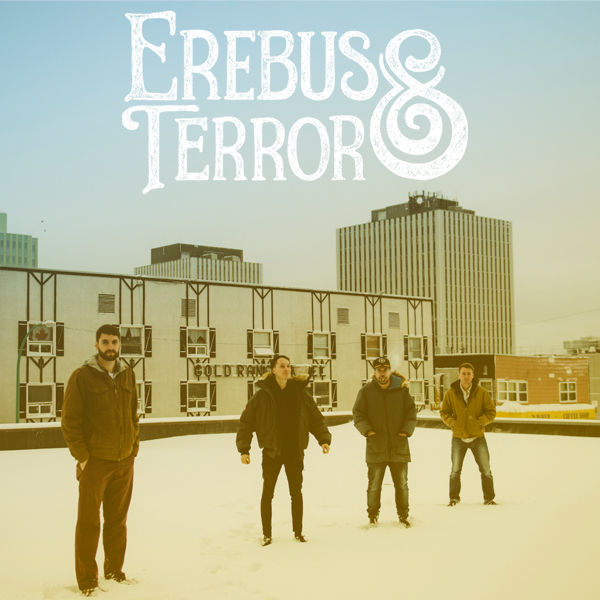 Erebus & Terror is a Canadian Indie Rock band from Yellowknife, Northwest Territories. Fronted by Singer-Songwriters Bryce Styan and Steve Whittaker, the band established itself in 2009. Performing under the Northern Lights and Midnight Sun, they’ve been a staple at Yellowknife’s Snow King Winter Festival and Folk on the Rocks. After producing a number of EP’s, they now have aspirations to take their act on the road. The band is currently working on their first full length LP. The album will showcase material from years of working with past and present contributing artists – it will also be a host to a collection of new songs. Bryce Styan was born and raised in Yellowknife, Northwest Territories. After taking up an interest in playing the Guitar at a young age, he convinced his mother to buy him a ¾ sized knock off. He began learning to throw around chords while his friend in the trailer next door was picking up the drums. This quickly developed into the songs that would fuel his first bands. In the years following, a diet of Bob Dylan, Broken Social Scene and the Flaming Lips would carry him through high school. Picking up what he could from the music of friends, he continued to contribute in the Northern music scene until collaborating with Erebus & Terror. Steve Whittaker was born and raised in the Nunavut Territory of Canada and moved to Yellowknife as a young teenager. Taught to play guitar by his older brother and his friends — he quickly began writing songs of his own and formed a band with his brother in high school. Growing up listening to heavy and nu-metal bands; it was the sounds of indie rockers ‘Modest Mouse’ and ‘Built to Spill’ that eventually shape his songwriting style. Steve met Bryce at 18, which kicked off collaborations in the years to follow. In the winter of 2009, founding members Steve Whittaker, Dave Whittaker, Travis Mercredi, Walter Girrior and Brendan Callas began jamming in a dimly lit basement and a smoky garage. Upon Bryce’s return to Yellowknife from a stint at university he came aboard and the band was complete. The band experienced success playing countless shows North of 60, being accepted to summer music festivals in Yellowknife, Fort Smith and Hay River. The Snow King’s annual winter festival, which takes place on frozen Great Slave Lake in a castle built of snow, has welcomed us with overwhelming reception year after year. (See EPK for full list of performances) Over the next few years, members would move on to pursue school and other endeavors but Steve and Bryce remained determined to continue writing and performing. Current contributing artists include Bryce Styan (Guitar, Vocals), Steve Whittaker (Guitar Vocals), Jeremy Sears (Percussion), Sean Robson (Bass).